What does Ramadaan mean to you? Who is exempted from fasting? What Is Eid Ul Fitr? Heat oven to 200ºC. 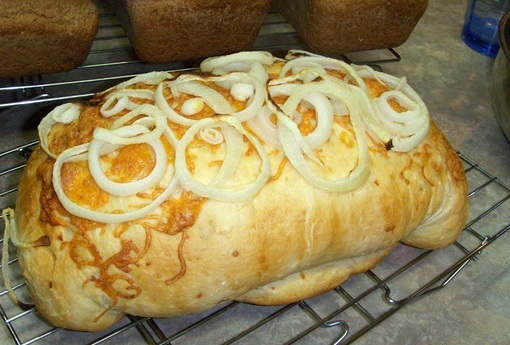 Spray and cook a large deep loaf tin or 2 small ones. Combine eggs, condensed milk and oil. Mix well and set aside. Add warm water. Mix flours, yeast and salt together. Add fried onion. Mix into a soft pliable dough with the eggs and condensed milk mixture. Knead on an oiled surface for 15-20min. Place into an oiled bowl. Lightly pat top of dough with oil. Cover with plastic. Leave in a warm place for about 25-30min. Slightly press dough down. Roll into a circle the size of the loaf tin. Roll into a swiss roll. Take care that sides is the same thickness as centre. Neaten and place into loaf tin. Brush lightly with egg or milk. Sprinkle onion slices on top of rounded bread. Place on middle shelf and bake for 30-40min or till done. Remove from the oven and allow to stand for 2min. Turn out and gloss the sides and top of the loaf with a little butter/margarine. If soft crust is desired, wrap in a cloth and leave to sweat. © 2019 Ramadaan 1439 – 2018. All rights reserved. Free Ramadaan Newsletter - don't miss out!